Donate to the Cucalorus Festival! Hey Cucalorians!!! Do you want some feel-good vibes? Want to fuel some art-filled dreams? Or how about feeding some creative monsters? Make a donation and we’ll send you a tax deduction letter to send your fuzzy little friends at the IRS. We know how to put your dollars to good use–we’re putting the sprinkles on top of the 24th annual Cucalorus Festival–taking place November 7-11, 2018!!! Help us fund the dreams and visions of artists all over the world by making a donation today. 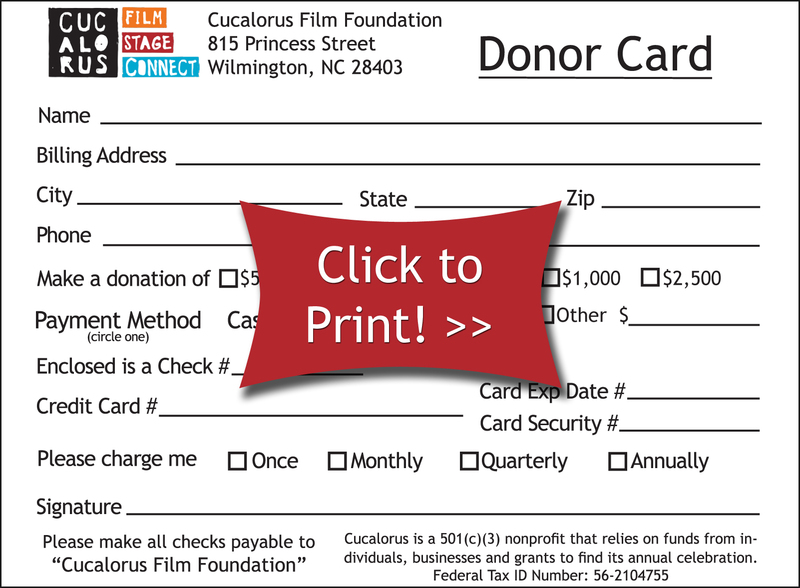 The Cucalorus Film Foundation is a 501c3 non-profit and your donation is tax deductible to the fullest extent of the law.